Not to be confused with Paradise (to be) Regained. 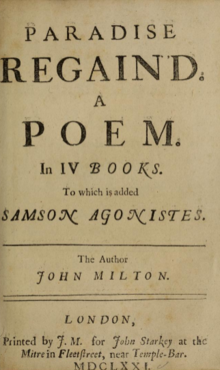 Paradise Regained is a poem by English poet John Milton, first published in 1671. The volume in which it appeared also contained the poet's closet drama Samson Agonistes. Paradise Regained is connected by name to his earlier and more famous epic poem Paradise Lost, with which it shares similar theological themes; indeed, its title, its use of blank verse, and its progression through Christian history recall the earlier work. However, this effort deals primarily with the temptation of Christ as recounted in the Gospel of Luke. Milton composed Paradise Regained at his cottage in Chalfont St Giles in Buckinghamshire. Paradise Regained is four books long and comprises 2,065 lines; in contrast, Paradise Lost is twelve books long and comprises 10,565 lines. As such, Barbara K. Lewalski has labelled the work a "brief epic". Whereas Paradise Lost is ornate in style and decorative in its verse, Paradise Regained is carried out in a fairly plain style. Specifically, Milton reduces his use of simile and deploys a simpler syntax in Paradise Regained than he does in Paradise Lost, and this is consistent with Jesus's sublime plainness in his life and teachings (in the epic, he prefers Hebrew psalms to Greek poetry). Modern editors believe the stylistics of Paradise Regained evince Milton's poetic maturity. No longer is the poet out to dazzle his readers with bombastic verse and lengthy epic similes. This is not to say that the poem bears no affinities with Milton's earlier work, but scholars continue to agree with Northrop Frye's suggestion that Paradise Regained is "practically sui generis" in its poetic execution. 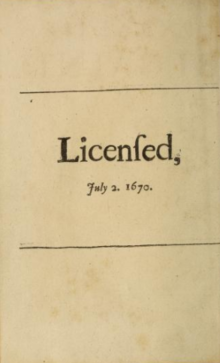 Frontispiece of Paradise Regained, circa 1671. One major concept emphasized throughout Paradise Regained is the idea of reversals. As implied by its title, Milton sets out to reverse the "loss" of Paradise. Thus, antonyms are often found next to each other, reinforcing the idea that everything that was lost in the first epic will be regained by the end of this "brief epic". Additionally, the work focuses on the idea of "hunger", both in a literal and in a spiritual sense. After wandering in the wilderness for forty days, Jesus is starving for food. Satan, too blind to see any non-literal meanings of the term, offers Christ food and various other temptations, but Jesus continually denies him. Although Milton's Jesus is remarkably human, an exclusive focus on this dimension of his character obscures the divine stakes of Jesus's confrontation with Satan; Jesus emerges victorious, and Satan falls, amazed. An interesting anecdote recounted by a Quaker named Thomas Ellwood provides some insight into Paradise Regained's development. After studying Latin with Milton and reading the poet's epic Paradise Lost, Ellwood remarked, "Thou hast said much here of Paradise lost, but what hast thou to say of Paradise found?" Hearing this, Milton at first "sat some time in a muse" before changing the subject; however, sometime thereafter he showed to Ellwood a new manuscript entitled Paradise Regained. Some maintain that although he seemed to express gratitude to Ellwood in a letter, Milton in truth "passed on a friendly if impish fabrication" that made Ellwood feel like the inspiration for the poem. ^ Frye, Return to Eden, 135. ^ "Introduction to Paradise Regained, in Complete Poetry, 631. Northrop Frye, The Return to Eden: Five Essays on Milton's Epics (Toronto: Toronto UP, 1965). Introduction to Paradise Regained, in The Complete Poetry and Essential Prose of John Milton, ed. William Kerrigan, John Rumrich, and Stephen M. Fallon (New York: Modern Library, 2007). Barbara Lewalski, Milton's Brief Epic: The Genre, Meaning, and Art of Paradise Regained (Providence: Brown UP, 1966). Susanne Woods, introduction to Paradise Lost & Paradise Regained, published by Signet Classics. Wikimedia Commons has media related to Paradise Regained.